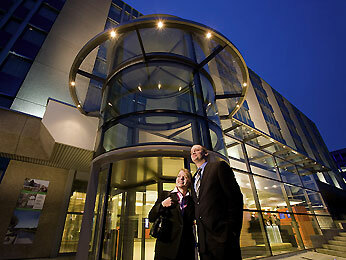 Enjoy an unforgettable stay at the Novotel Zurich Airport Messe and experience the hotel motto “Modern easy Living”. The 4 star hotel is the perfect location for your stay in Zurich; with the free airport shuttle and the trams you are a short ride away from Zurich airport and city centre. The hotel is adapted for seminars and events for groups up to 320 people. On the terrace and in the gourmet’s bar, the team spoils you with fine food and drinks. Free Wi-Fi, 24h-roomservice, Fitness space and Sauna. This combination of rooms running from “Zürich” to “Lausanne” provides 240 m² and is equipped with the latest conference technology. Natural light, soundproofing and airconditioning offer ideal conditions for meetings or seminars with up to 130 people.